Hot tubs provide pain relief for general stiffness and arthritis aches. 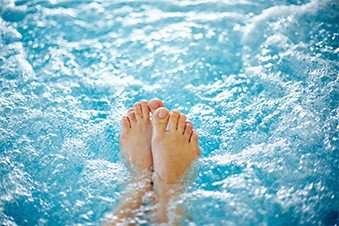 The warm, pulsating water increases blood supply to aching joints, stimulates the release of endorphins to improve mood, and decreases muscle tension for more flexibility. With contemporary styles and fiber-optic or LED lighting, a hot tub can become the centerpiece of your yard. Indoor units are also available and are normally placed in larger bathrooms or sunrooms that have extra space. Whether you’re looking for an in-ground hot tub or a spa tub, AllStar Pool & Spa has you covered. In addition, maintenance for hot tubs has never been easier, and the with years of expertise, AllStar Pool & Spa can ensure you’ll be perfectly equipped to take care of your hot tub for years to come. There are many reasons behind the consistent popularity of private hot tubs. Today, hot tub designs allow you to create the perfect backyard oasis based on your personal preferences. Size is a decision you should make early on in the design process. Your hot tub can be a small, intimate setting for you and a single partner, or a larger space to accommodate multiple family members and friends in a social setting. The purpose of your Swim Spa should also come into play when creating your ideal hot tub. A hot tub can serve solely for relaxation or hydrotherapy, while a swim spa provides a compact space for exercise or rehabilitation. opting for high-efficiency pumps and jets can also help you maintain a greener, lower-cost backyard feature. Master Spas – Create your own backyard oasis with a perfect blend of art and science. Hear the waterfalls, enjoy the music, watch movies on your iPad, and feel the atmosphere created by the color changing LED lights. Amidst these calming features, the powerful, exclusive therapy jets put you in complete control of your wellness. Your remedy and relief is waiting for you. Slip in, relax, and recharge. If you are looking for a spa tub in Birmingham or the surrounding area, see Master Spas full product line at AllStar Pool & Spa. Michael Phelps Legend: The series by Master Spas offers backlit air controls and valves, crystal-like jets, and sophisticated stainless steel accents. This collection features advanced technology that allows you to easily manage every hot tub function with the color display control panel, smartphone, or tablet app. Twilight Spa: Our Twilight spas offer legendary quality and industry-leading design of luxury portable spas by Master Spas. This series redefines the experience with stress relieving features like biomagnetic therapy, hydrotherapy jets, and noise reduction pumps and motors. Healthy Living Spa: These spas promote a buoyant balance for a fit mind, body, and spirit. Clarity Spa: With Clarity comes serenity — that gentle, overall sensation of comfort and security. Nordic Spa: Designed to massage both the front and back parts of the body, Nordic’s Dual Therapy System combines massage jets with the benefits of a whirlpool circular motion. The stylish design and innovative features are available at an affordable price. Please call us at Birmingham location or Gardendale location.